Geometric shapes are the basic building blocks of life. From the organic forms of nature to the intricate designs of man, such principle shapes allow for the construction of the world around us. The combination of octahedral and tetrahedral forms allow for the construction of a variety of dynamic architectural compositions. The resulting product is a bold energetic statement; the severe angles and changing planes spark interest and curiosity in the viewer. 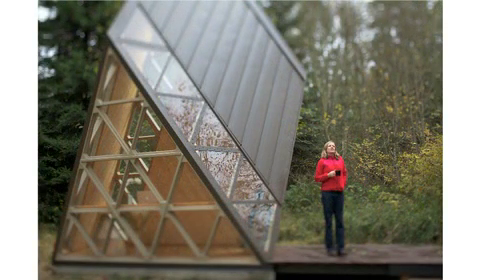 Literally taking you “outside the box”, this architectural form moves in a direction away from tradition and normality. There is an element of beauty found in its pure form. Derived from simplistic and primary triangular components, representing strength and stability, the structure’s natural shape mimics the properties of this basic geometric unit. ECOSOLO is essentially the culmination and refinement of a building design first sketched on paper nearly 30 years ago. Moving away from geometric design itself, ECOSOLO exhibits a strong focus on material and construction system economics. Through the use of minimal renewable building components, simple “low tech” fastening devices and an emphasis on maintaining maximal structural strength, ECOSOLO is a building possessing superior structural integrity while consuming far less material. 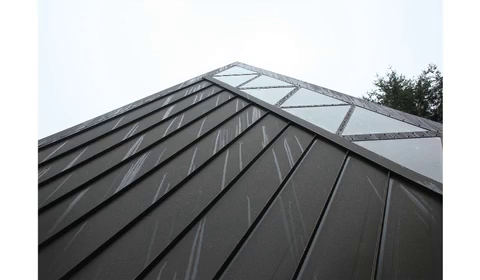 Additionally, the largest portion of ECOSOLO’s exterior surface is maintenance free and designed to withstand the most extreme weather conditions, reducing the cost and hassle of upkeep and avoiding limitations of other building designs. The built-in Photo Voltaic Powered Silent Air Destratification system runs continuously, working to return the heated air that rises to the structure’s twenty-foot peak back down to the floor level. This works to reduce condensation and stagnation of the interior air, even when the building is unoccupied. Limitation of resources due to remote off-the-grid building sites can be accommodated by using ECOSOLO’s LED/Battery/Lighting system that provides a continuous supply of energy, maintaining functional lighting. * Uses less than half the board feet of lumber as standard 2X6 residential construction. * Uses inexpensive 1×4 clear mix grain Douglas Fir and select structural Douglas Fir 2X4. * All framing assemblies are bolted and or screwed together making disassembly and relocation and option. * Optional designs include building foundation using just four ecology blocks, producing a 120 ft.² floor with a less than 50 ft.² footprint. * 55 windows incorporated in design provide excellent solar gain and a wonderful natural light environment.